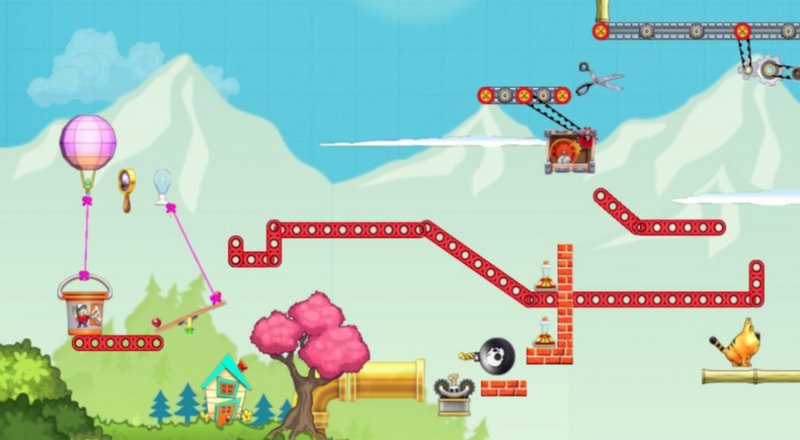 The sandbox physics game Contraption Maker recently received a tidy little update that fixed a massive list of bugs and incorporated an almost as massive list of tweaks and improvements. New sound effects were also added, but the best news is online co-op has been switched on. It's time to build, people. BUILD! Contraption Maker was released as an early access game in September 2013 with a handful of basic toys to play around with and some official levels to puzzle over. Community-created stages quickly filled in the gameplay gaps, but the feature we really wanted to get our hands on was the promised multiplayer support. This update adds a very basic form of co-op. Players can hop on servers and build contraptions together very much like the single player "make" mode. Only, you know, with other people. The basic premise of Contraption Maker is to place items from your inventory to solve simple puzzles using realistic physics. Ball falls here, turns on toaster, shoots toast to activate rocket, that sort of thing. Ready to make a smoothie? Fortunately, all you have to do is turn on the blender. How do you turn on the blender? Glad you asked. Contraption Maker never does things the easy way, which is why it's so fun, even in such an early stage of development. Developer Spotkin has noted that this is only the "first step" for online play, and since the game is still in alpha, expect more good things as time goes by. For now, just build some weird stuff and have fun. Page created in 0.9891 seconds.